Really is about time the Sun went down for good, this really isn’t really what these Organ pages are about, but that vile “newspaper” has been allowed to exert far too much power and manipulate far too many people for far too long, it really is time to boycott The Sun completely, there are so so many reasons why it has to be taken down, and good on Mr Brand for having the balls to put his career second and point these things out…. 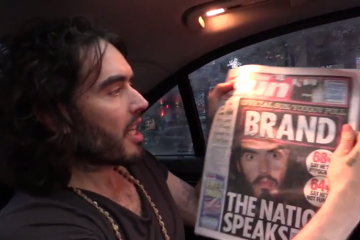 Published on Dec 5, 2014 – Russell Brand, The Trews (E205). – “There are definitely more important things going on than polls about me. But the issue of corporations finding loopholes to avoid paying billions in tax – whilst austerity measures continue – is certainly important. Subscribe Here Now: http://tinyurl.com/opragcg and send links to video news items of topical stories that you’d like me to analyse”.